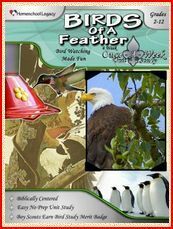 As part of The Schoolhouse Review Crew, I received a download version of Homeschool Legacy’s Birds of a Feather Once a Week Unit Study. Homeschool Legacy and Once a Week Unit Studies were started by a homeschooling mom of 16 years. She designed the unit studies for students to have more fun learning and for moms to have more fun teaching. These once a week unit studies are for students of all ages. Your whole family can have fun learning together. Once a week unit studies are just that. You set aside one day a week to work on the study. The rest of the week, you do your regular books and read the individual and family read alouds from the study. On unit study day, you set aside your regular books and have fun doing all the activities and projects in the unit. The units vary in length, some are 4 weeks, some are up to 8 weeks long. An added feature of the once a week unit studies is the students can earn Boy Scout and American Heritage Girls badges by completing the studies. The book tells you exactly what the student needs to accomplish to earn the badge. If you have any scouts in your family, this is a great way for the family to help them work towards their badges. The Birds of A Feather Once a Week Unit Study I received gets kids excited about science while studying some of God’s most beautiful creations. This unit study is 4 weeks long, so we were able to complete it during the time I had to work on this review. I did this study with my 12 year old, 6th grade son. We had a lot of fun together doing this study. I am very impressed with the amount of information, book & movie lists, activities in this unit study. There are suggestions for individual and family reading. Movie suggestions for family movie night and great field trip ideas. Even themed based devotions are included. You start each week by reading the lesson from the book, then branch out into the other activities. 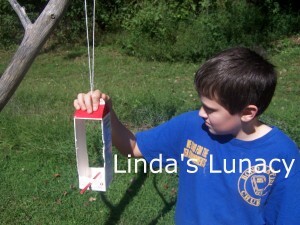 One of the projects he did was this milk carton bird feeder. He did this all by himself. I showed him the picture in the book and read him the instructions. He did all the rest. It’s still hanging on our porch. We also dissected owl pellets. Two of the other kids joined us for this activity. Here’s one of the sheets they sorted the bones onto. 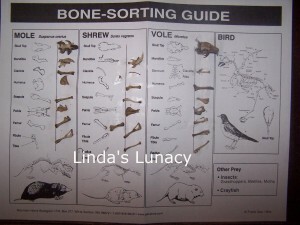 All these bones came from one owl pellet. Very interesting. 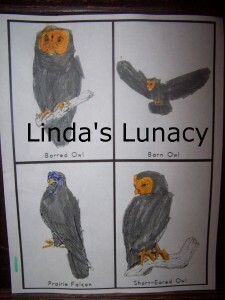 He did an owl coloring sheet. He was clearly in a hurry when he did this. He also did one of a cardinal, our state bird. There are no required books or activities. There are plenty of suggestions, though. For example, can’t find the books on the suggested list? That’s ok, find another one from the same category to read. If we had read all the books suggested, watched all the movies, did all the activities and went on all the field trips, it would have taken much longer than four weeks to complete. There is so much to choose from that you can choose what works best for your family. There are scheduling tips on the website to help you fit in your regular studies and the once a week unit study. I highly recommend the once a week unit studies as a fun, and educational, addition to your regular studies. We really liked Birds of a Feather. While I received a download PDF ebook, this product is only available as physical book. The Birds of a Feather Once a Week Unit Study sells for $15.95 on the website.